Antarctic fast ice is of key climatic and ecological importance, yet its distribution and variability are poorly understood. We present a detailed analysis of fast ice along the Adélie Land coast (East Antarctica) using satellite data from 1992 to 1999. Fast ice formation along this coastline is intimately linked to grounded iceberg distribution in waters of <350 m depth. Considerable interannual variability occurs in areal extent and formation/break-up; the variability is related to wind direction. 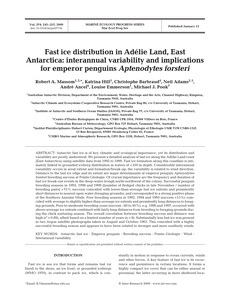 Distance to the fast ice edge and its extent are major determinants of emperor penguin Aptenodytes forsteri breeding success at Pointe Géologie. Of crucial importance are the frequency and duration of fast ice break-out events in the deep-water trough north-northwest of the colony. Successful penguin breeding seasons in 1993, 1998 and 1999 ([number of fledged chicks in late November / number of breeding pairs] >75% success) coincided with lower-than-average fast ice extents and persistently short distances to nearest open water (foraging grounds), and corresponded to a strong positive phase of the Southern Annular Mode. Poor breeding seasons in 1992, 1994 and 1995 (success <15%) coincided with average to slightly higher-than-average ice extents and persistently long distances to foraging grounds. Poor-to-moderate breeding years (success ~40 to 50%), e.g. 1996 and 1997, occurred with above-average ice extents combined with fairly long distances from breeding to foraging grounds during the chick nurturing season. The overall correlation between breeding success and distance was high (r2 = 0.89), albeit based on a limited number of years (n = 8). Substantially less fast ice was present in two Argon satellite photographs taken in August and October 1963. This coincided with a highly successful breeding season and appears to have been related to stronger and more southerly winds.